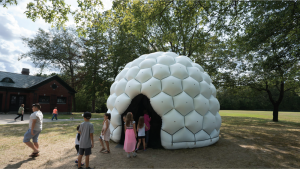 PNEUHAUS is a design collective focusing on the mastery of all things inflatable. At PVDFest 2019, they will be debuting their new project Pnit. The 3D hanging installation takes the form of a macro-scale section of a knit textile swatch, drawing inspiration from Providence’s rich history in the textile industry.